Canadian Ambassador to Seoul Ted Lipman(2nd from left) and Chairman Simon Bureau of The Canadian Chamber of Commerce in Korea(2nd from right) pose with VIP guests. 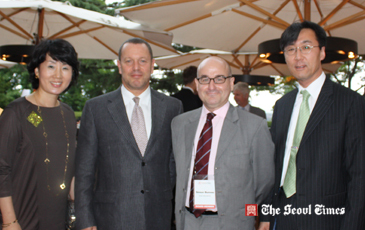 Chairman Simon Bureau of The Canadian Chamber of Commerce in Korea (CCCK: CanCham Korea) hosted a reception on July 1, 2009 at Grand Hyatt Seoul's JJ Garden on the occasion of the Canada Day. Hundreds of VIP guests were invited to the dinner reception which started at 6:30 p.m. and lasted late into the evening. Among the VIP participants were Canadian Ambassador to Seoul Ted Lipman, Director General Chang Ho-Jin of North American Affairs Bureau of South Korea's Foreign Ministry, and Managing Director Byun Dong-Hyun of Canadian Tourism Commission. Canada Day, formerly Dominion Day, is Canada's national day, a federal statutory holiday celebrating the anniversary of the 1 July 1867 enactment of the British North America Act, which united Canada as a single country, which was in turn composed of four provinces. This year, the format of annual Canada Day reception has been changed to better reflect the mission of CanCham Korea and better serve the needs of its members. While the main objective is to celebrate Canada Day itself, this new format corresponds to a "Canadian Business Networking Day." The intrinsic value of attending the event is the networking potential and the entertainment. It served to raise the profile of the Canadian Business community in Korea. In a welcoming speech, Amb. Lipman stressed the need for future cooperation. "Canada will work together with Korea in business, education, and culture," he said. Chairman Simon Bureau also made a welcoming speech and he emphasized bilateral ties between Canada and South Korea in many spheres of society. National anthem of Canada was played priot to the dinner. Live jass misic by Laventana & Ran were also played during the dinner reception at the garden. There were lucky draw event and many gifts were distributed. The prizes included Candaian wine, tickets for hotel accommodations, round-trip airplane tickets for Seoul and Vancouver. Canada officially established diplomatic relations with South Korea in 1963. Since then the two have had its embassy in eacher other's country. Canada opened its ties with North Korea 2001. When North Korea invaded the South Korea in 1950, Canada came to aid South Korea against the Communist invaders. During the fratricidal war Korean War (1950~53) Canada contributed the third largest number of soldiers among the 16 UN countries who helped South Korea. A total of 26,791 Canadian soldiers were dispatched to the Korean Peninsula during the conflict. More than 500 Canadian soldiers were killed in the war. In 1994, an agreement was signed to waive visa requirements for nationals from both countries, allowing citizens from each other's countries to stay for up to six months without a visitor's visa. Canada and South Korea maintain strong partnership and cooperation over the last 50 years. Two countries share membership in many multilateral economic organizations including APEC, OECD, WTO, and G20 and support the process of trade and investment liberalization as well as economic and technological cooperation. Over the last decades business ties as well as other areas have been on the rapid increase between Canada and South Korea. Last year alone, trade between South Korea and Canada increased by 15.7 percent. Korean exports to Canada amounted to 4.05 billion US dollars. Korea imported from Canada some 4.40 billion US dollars' worth of goods. As of 2009 Canada is the 14th largest trade partner of South Korea. For details or inquiries please contact CanCham Korea at 554-0245~6. Grace Kee, who serves as staff reporter for The Seoul Times, studied English language and literature at Sookmyung Women's Univesity. She served as campus journalist for the Sookmyung Times for three years. She covers cultural affairs as well as diplomatic coummunity in Seoul.